In 1994 Dhana became the first Jamaican Car Rental Company to advertise on the internet. 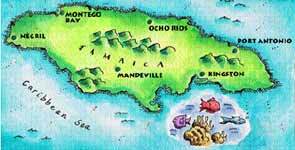 We recognized that "direct to customer" rentals meant we could offer the best car rental rates on the island of Jamaica. These low rates, combined with our personalized, professional and friendly Jamaican service, proved to be a winning combination. Dhana Car Rental & Tours, Ltd. has been the leading car rental company in Jamaica for the last ten years. Since public transportation in Jamaica is very limited, your own rent-a-car in Jamaica from Dhana is the first step towards a truly unique Jamaican vacation. A rent-a-car will give you the freedom to visit non-traditional tourist locations and experience real Jamaican culture. All you need is a valid driver's license and a major credit card. Our fully automated internet based reservation system allows you to view the complete cost of your rent-a-car online before making a reservation. Also, our best available rates are for reservations made more than 30 days before the pick-up date. So come on in and check out Dhana Car Rental & Tours now. Read our customers testimonials by clicking here!